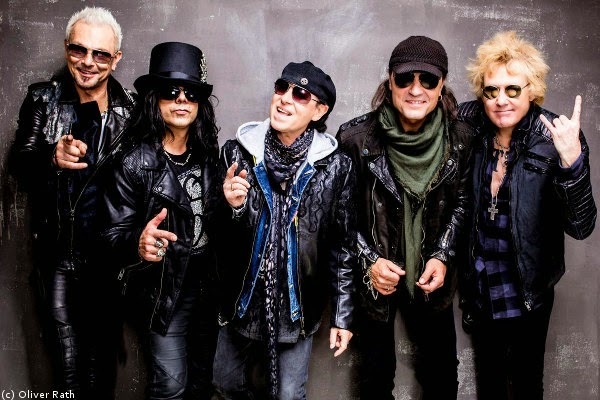 Rock & Metal 4 You: CD-Review: Scorpions - "Return To Forever"
Oh, who we have here? Who would have believed that the legendary Hard Rock band from Germany would release another album? I think the answer is: Everybody! Their 2010 record "Sting In The Tail" was announced as the last Scorpions album together with a farewell tour and I still remember that nobody of my friends believed this. It was so obvious that the chapter "Scorpions" wasn't closed. I mean in the following years they released a live Blu-Ray in 3D, then the "Comeblack" album with cover songs and a MTV Unplugged record. No, it was just a matter of time and this time has finally arrived. Yesterday "Return To Forever" hit the stores. Are the Scorpions still hungry for more or is it just the need of money? To be honest I never was the biggest fan of this band. I like some of their classics very much and also "Sting In The Tail" was a really good album to me, but I didn't had much expectations when I put "Return To Forever" into my CD-Player. Yeah and what can I say: to me this album is the best album this band did in years! I never thought that but "Return To Forever" impressed me from start to finish and I can easily tell you why: the songmaterial is very catchy and very varied. You have everything on here a fan of this genre can ask for. You have groovy, riff-oriented hard rockers like the opener "Going Out With A Bang", "Rock My Car" or "Rock'n'Roll Band". You have the radio-friendly stadium anthems like "We Built This House", "Catch Your Luck And Play" or "Hard Rockin' The Place" which all have hitpotential and of course you have the dreamy ballads ("House Of Cards", "Eye Of The Storm" & "Gypsy Life"). To name some highlights here is very hard because I enjoyed this album from start to finish. I bought the Deluxe Edition with 17 songs on it and I never had the feeling of listening to filler material. I loved the huge hookline in the chorus of "We Build This House", the heavy riffing of "Rock My Car", the sweet melodies and harmonies of "Gypsy Life" and most of all the fantastic catchiness and vibe of "Rollin' Home", that features cool slide-guitars and an awesome chorus. I can't get this out of my head - it's an earworm. Yeah and also the bonustracks were very enjoyable, especially "One And One Is Three" with it's great highway-feeling. The record consists of new material mixed up with some song ideas that have their roots in the 80's and you definitely hear that. This album transports the Scorpions essence of the 80's into the year 2015 with a modern sound and it's pure fun to listen to it. Klaus Meine still sounds great and unique. Schenker and Jabs deliver stunning guitar work as well as James Kottak and Pawel Maciwoda ensure a tight rhythm section. The production was handled by Mikael Nord Andersson & Martin Hansen again and the whole record sounds simply great. The only thing, that could annoy some fans is the fact that this album has more calm moments (especially when you own the Deluxe Edition), which means there isn't so much heavy in-your-face Rock like on "Sting In The Tail". But therefore the mixture between hard Rockers, ballads and airplay hits is much better, because every single song sounds different here. To come to an end: "Return To Forver" is a huge exclamation mark in the career of this legendary band. It combines all the strengths and trademarks this band is known for. For sure there aren't any experiments here and the Scorpions deliver what they can do best, but within the genre "Return To Forever" shines with its variety and great performances by all band members. If the Scorpions can hold this high level I really hope these guys returned to stay with us forever!